Happy New Year! Our team always enjoys the holidays, especially as we take time to look back at the year and start to plan for the year ahead. 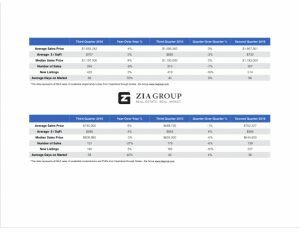 As we look into 2017, we couldn’t be more excited about what this year holds for the Zia Group’s continued investment in impacting our communities, and for our investment in the Santa Barbara & Montecito markets. One of the questions we get asked most often as real estate professionals is: “What is the market doing?” As we kick off 2017 we have been speaking with a lot of clients who are looking for advice on how to position their real estate investments and navigate the the mixed signals the market is giving us. Since the last bottom of our local real estate market in 2011, we have experienced a strong Seller’s market where we have seen low inventory, high buyer demand, and increasing home values. Last year, about 2% fewer single family homes were sold with 1,114 total units for the year. Even though fewer homes were sold in 2016 compared to 2015, at quick glance, the median price in our area did rise slightly. In 2016 the median price for Santa Barbara’s south coast was $1,149,500 or about 4.5% above the median price for 2015. At a wider glance, when we consider the last two years, the appreciation trend is mostly flat, mirroring the last peak of the market toward the end of 2005. In fact, our current home prices are close to, though still a little bit below (roughly 6%), peak prices in 2005, almost matching 2006/2007 prices. As the market transitions, one key metric we track closely is months of inventory (Absorption Rate). In a strong seller’s market we see the Absorption Rate around 3-4 months, meaning if no new homes came up for sale, it would take 3-4 months for all of the homes to sell. Most consider a balanced market between 5-7 months. Over the Summer and Fall of last year our absorption rate kept climbing, giving many of us concern about 2017. Thankfully, while it peaked at around 6 months of inventory, the absorption rate has been declining since the Election. We are currently right at about 4.5 months, and activity in the New Year has been really strong. As such, our optimism has increased for the overall market in 2017. While we may see our real estate market continue to rise and appreciate for a number of more years, these conflicting market signals make your relationship and communication with the Zia Group, your real estate adviser, even more critical. What to do with your home or investment property isn’t always a simple answer. Your home’s location, neighborhood growth and projected appreciation, and of course your personal situation and nuanced goals, are all variables that we are happy to help you explore and create a strategic plan that best positions you to take advantage of the opportunities our local market is going to see in 2017. We look forward to working with you in 2017 and if you know of anyone looking for a real estate adviser, we would be honored to get connected.